Modern life is becoming exponentially more crowded with influences from all directions. There are so many new gadgets, entertainment options, and immediate work needs that it is becoming increasingly difficult to create space for taking care of ourselves. We generally have/make less time to cook healthy food, get enough exercise, and rest than ever before – it is draining! That is why life hacks have become so popular. 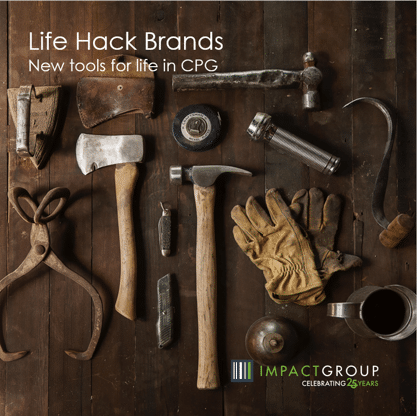 A life hack is an item or technique used to make everyday tasks simpler and we are now seeing that trend creep into the CPG industry. Soylent was started by a Silicon Valley entrepreneur who was spending so much time working that he realized his food options had become largely vending machine based. He went from building complex computer code to producing an easy and balanced way to get proper nutrition without compromising convenience. The name started as a joke reference to the 70’s classic movie Soylent Green, though there are no people in this version. The Soylent shakes are built to bring efficiency and precise nutrition to people who are having a difficult time fulfilling those needs. Now, the company has landed upwards of $70 million in capital investment since beginning in 2013 and continues to expand its global reach. Currently, research continues to surface regarding the effect our microbiomes have on every element of our lives. From depression to chronic physical disorders, scientists are finding that gut health is increasingly at the root of many modern problems. The latest life hack for any variety of personal issues is fast becoming pro-biotics. While this has historically meant taking a pill, options are now expanding to include a bevy of new and interesting ways to get healthy gut bacteria. Lifeway Foods has become a leader in probiotic products based on kefir and has recently launched a vegan line extension called Plantiful. This product offers pro-biotic support in a delicious pea-protein drink. Plantiful was highlighted by Eating Well as one of 2019’s best new products at Expo West. If hangovers are your issue, there is a life hack for that. Former Tesla employee Sisun Lee has developed a recovery shot to take before or during a night out in the bars. The More Labs elixir is marketed as negating the effects of alcohol by boosting the liver and thus the body’s ability to process alcohol. The company’s next steps are looking into lifestyle aids for stress, sleep, anxiety, focus, and creativity – they’ll have a solution for everything if they possibly can! Finally, the one thing everyone could use more of and has never gone out of style yet eludes 35% of the general population in the US—sleep. It is so necessary, but rare in a modern world where our brains have an increasingly difficult time winding down at the end of the day. The constant vying for our attention devices and advertisers on top of work and the everyday stress of life has left the average American bereft of sleep, causing major downstream effects on health and mental well-being. Traditional sleep aids come in pill form, however there are now an increasing number of alternatives. SOM Sleep is a convenient drink containing L-theanine amino-acids and GABA to help you relax. It also contains B6, magnesium, and melatonin to regulate sleep cycles. Mykind Organics by Garden of Life produces a spray called Sleep Well R&R. A mixture of L-theanine and relaxing herbs allows you to fully relax before bed, promoting deep sleep without a groggy after-effect. There are also a range of topical products in various forms such as cream and essential oils. Sleep Starter by Patch MD is a wearable source of melatonin and relaxing herbs to help relax the body in preparation for sleep and help maintain healthy sleep patterns. With so much going on in life, from phone screens to endless on-demand tv, and work emails at all hours, it is more important than ever that we are intentional about self-care. That includes making time to exercise, eating healthier, and staying in touch with loved ones, but something must give. That is where life-hacks are carving a niche and getting us back on track in this modern world using modern methods. It is no surprise that CPG brands are getting in on the action, but continually surprising is how the innovative minds behind these brands address modern concerns.